methi pulao recipe | methi rice recipe | fenugreek rice recipe with detailed photo and video recipe. a healthy and flavourful rice or pulao recipe prepared from fresh methi leaves or fenugreek leaves. an ideal lunch box recipe or which can also be relished for dinner and is typically eaten with raita and or any dal recipe. methi pulao recipe | methi rice recipe | fenugreek rice recipe with step by step photo and video recipe. 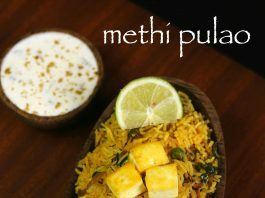 there are several ways the methi pulao or methi rice is prepared. out of all simple methi fried rice which is known as methi pulao. the other is tomato mixed in fenugreek leaves and mixed with cooked rice which is popularly known as tomato methi rice. 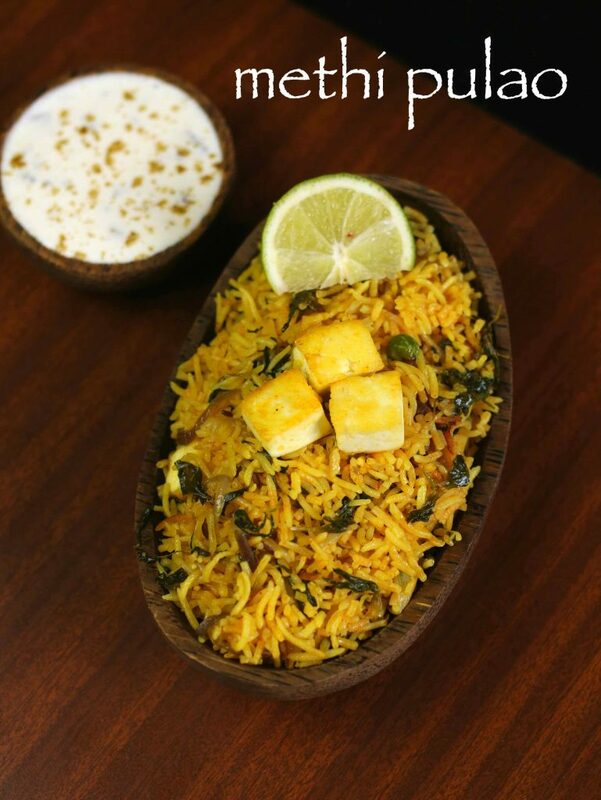 in this recipe post we would learn how to make healthy and simple methi pulao. i have shared quite few methi recipes till now which includes, methi paratha, methi malai paneer, methi thepla and few others. the main reason i try to share more and more methi recipes because of the health benefits the fresh methi leaves has to offer. it is rich in iron, vitamin and calcium. moreover it also helps to reduce the bad cholesterol and improves liver and heart health. it is also believed that methi leaves are good for skin and long and black hair. certainly these reasons are more than sufficient to include methi recipes or methi pulao in your daily diet. furthermore, some important tips and suggestions for a perfect healthy methi rice recipe. firstly, never chop methi or fenugreek leaves to methi pulao or methi rice recipe. pluck the leaves from them stem and then add, otherwise it may release its bitterness. 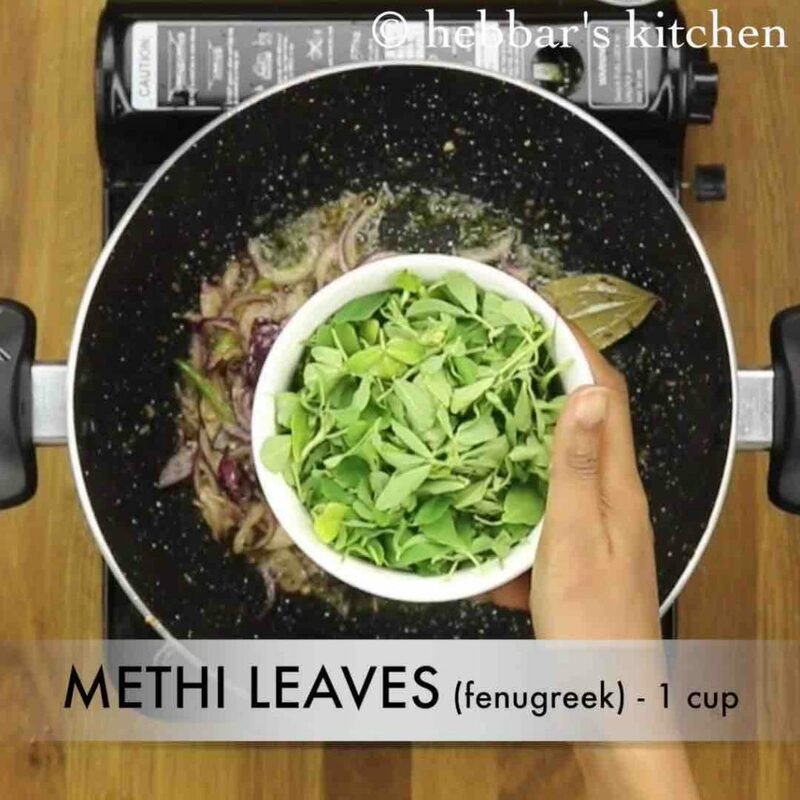 secondly if you wish to completely avoid the bitterness of methi leaves, than soak it in salt water for 10-15 mins before using it. 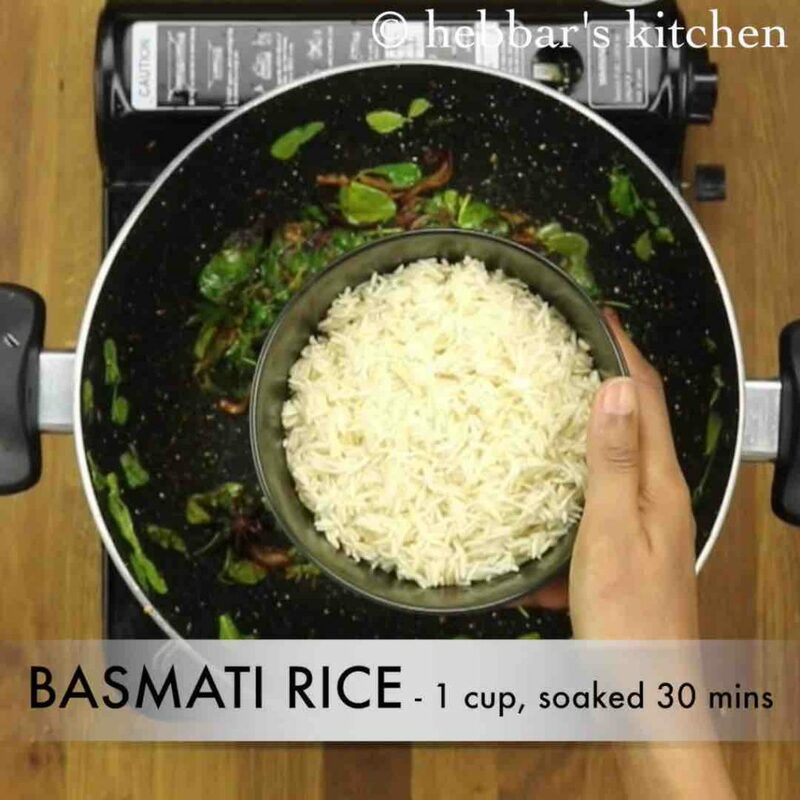 lastly, i have added soaked rice in this recipe and i have cooked the rice with methi leaves. 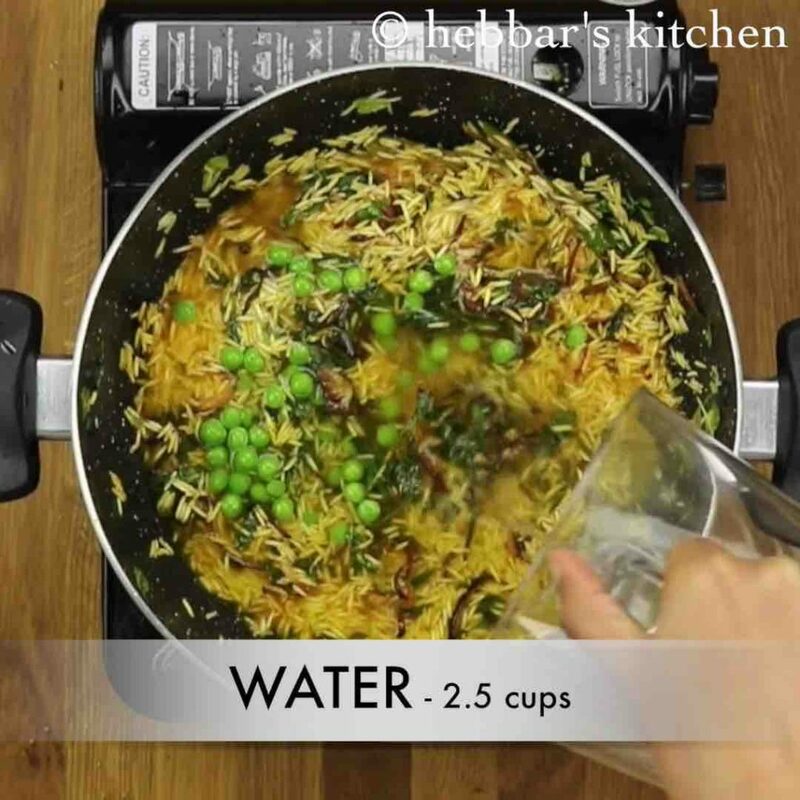 alternatively, you can directly add the leftover cooked rice and mix it with sautéed methi leaves. firstly, in a kadai heat ghee and roast paneer pieces. roast paneer till they turn golden brown. keep aside. further in the same kadai add in spices and saute till they turn aromatic. 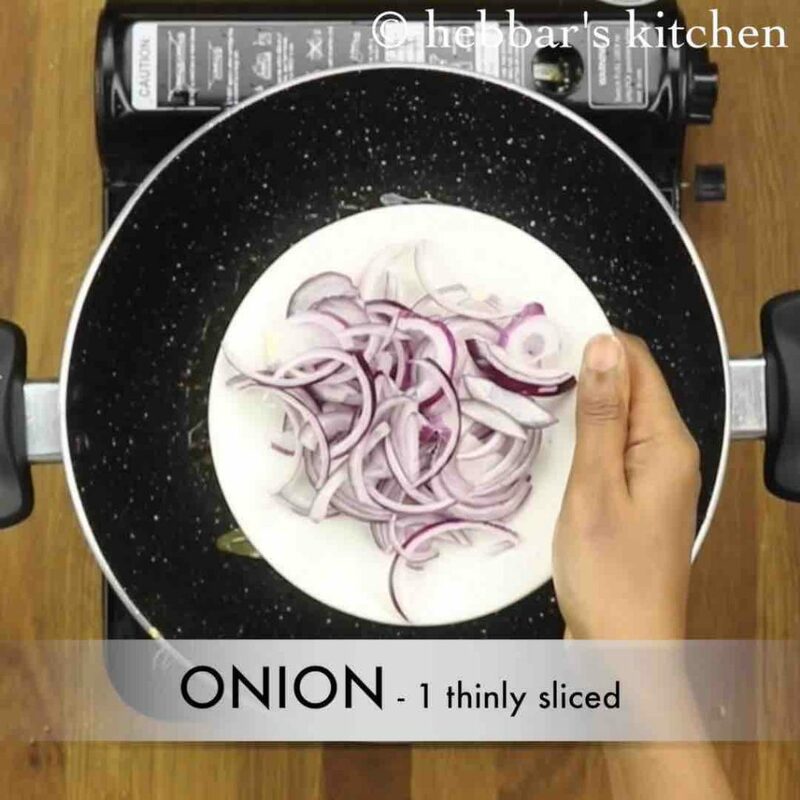 additionally, add in onions and saute well. now add chilli and ginger - garlic paste. saute well. furthermore, saute methi leaves till they shrink in size. now add turmeric and chilli powder. saute for a minute. add in 1 cup basmati rice, soaked 30 minutes. 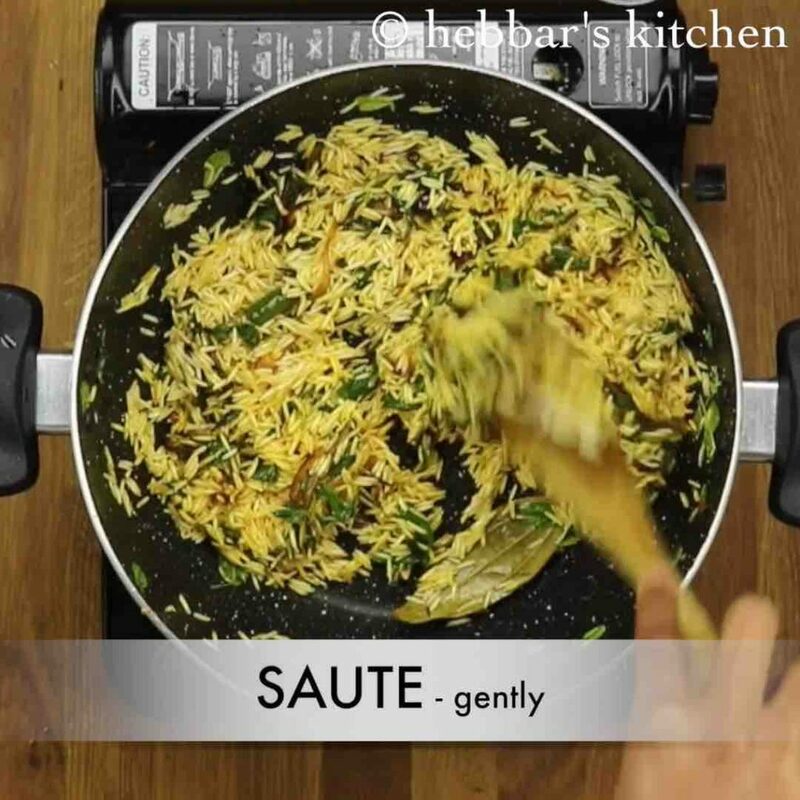 saute for a minute without breaking rice grains. now add peas, water and salt to taste. 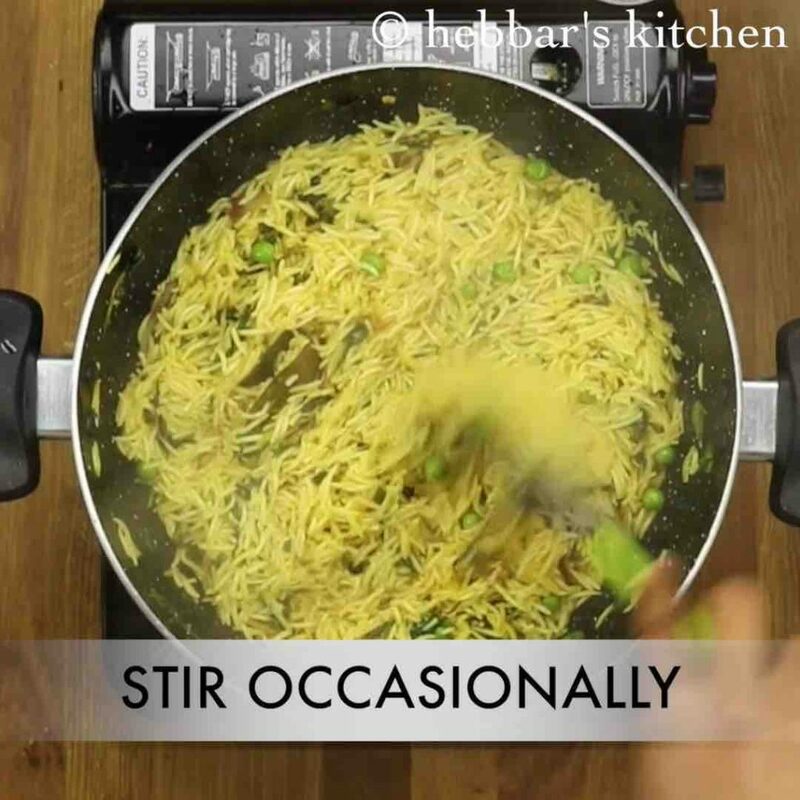 stir well and cover and cook till rice gets cooked well completely. 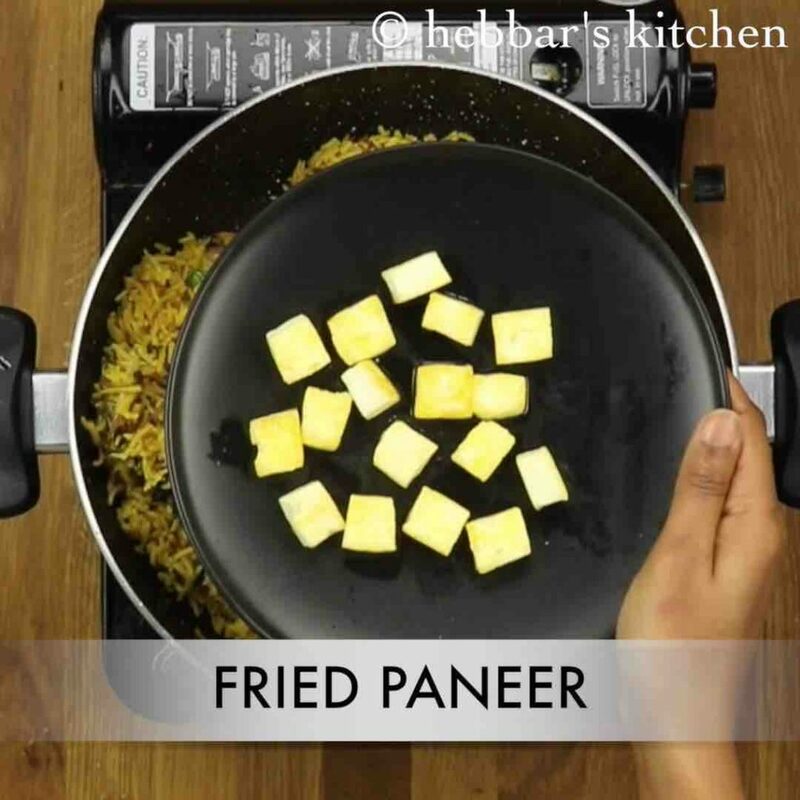 now add roasted paneer and mix gently. 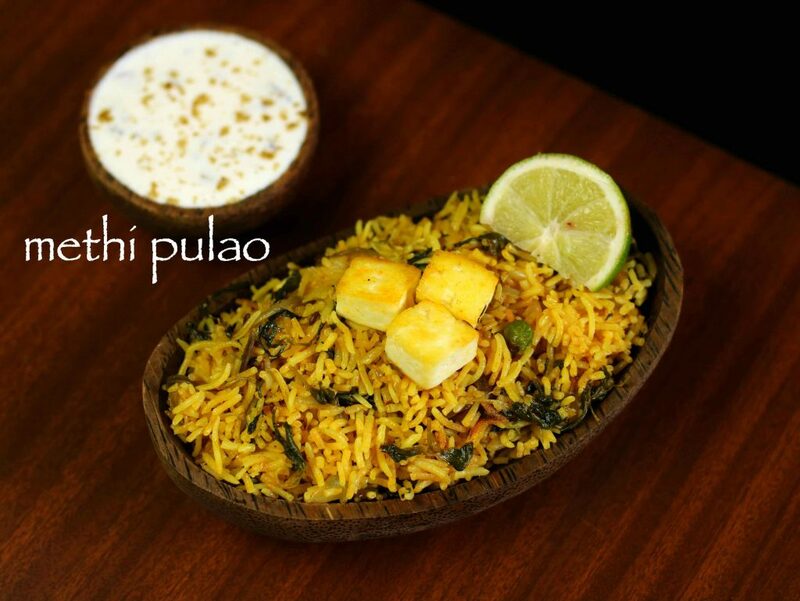 finally, serve methi pulao with lemon and raita of your choice. 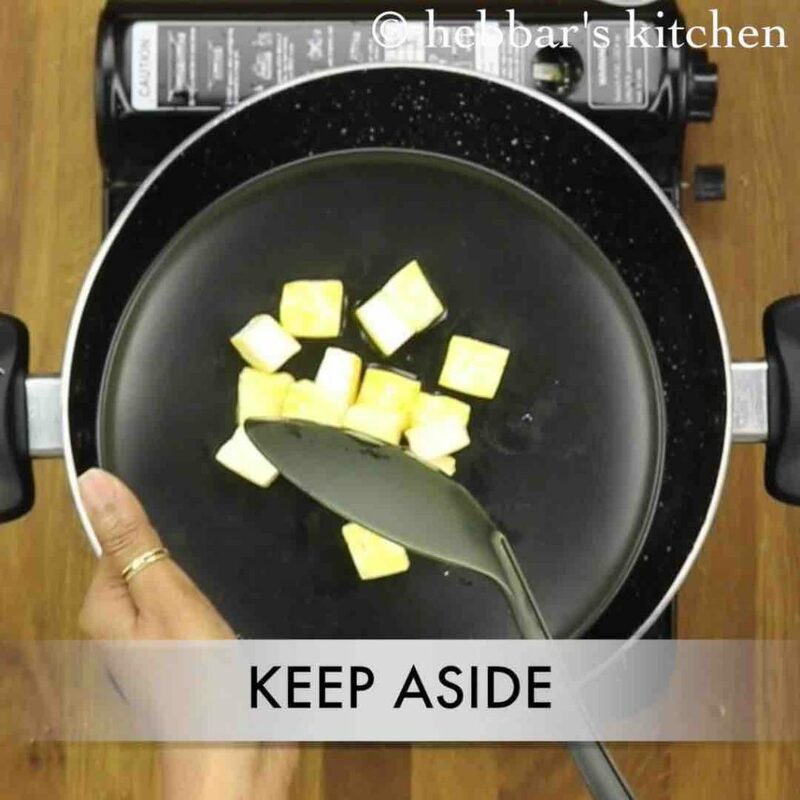 firstly, in a kadai or cooker heat ghee and roast paneer pieces. 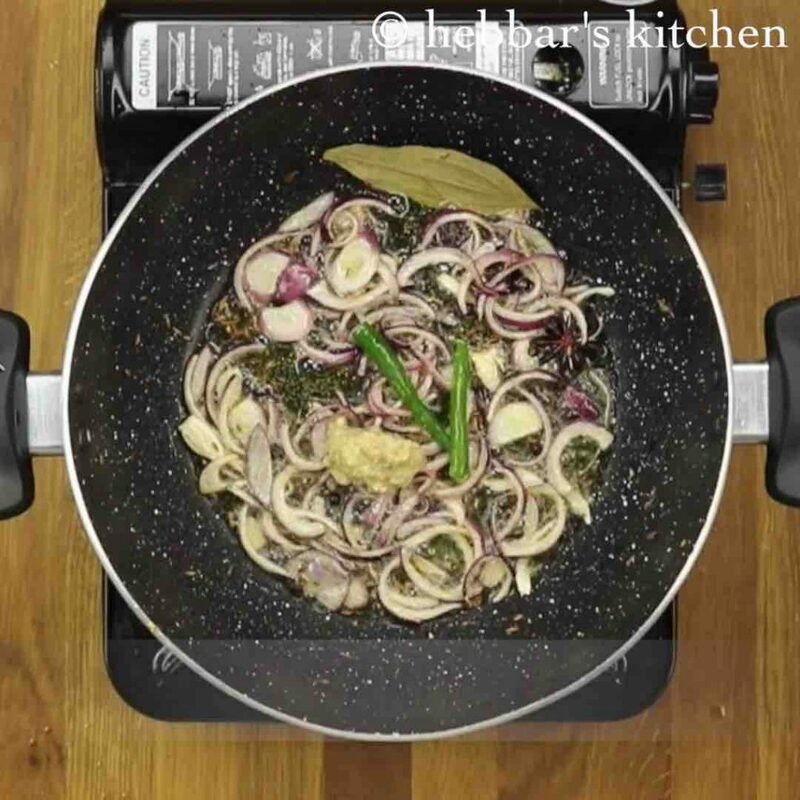 further in the same kadai or cooker add in 1 tsp cumin, 1 bay leaf, 1 star anise, ½ tsp black pepper, 1 inch cinnamon stick and 5 cloves. saute till they turn aromatic. now add 1 green chilli and 1 tsp ginger – garlic paste. saute well till the raw aroma disappears. furthermore, saute 1 cup methi leaves till they shrink in size. make sure to separate the leaves and discard the stem. also do not chop methi as they makes pulao bitter. 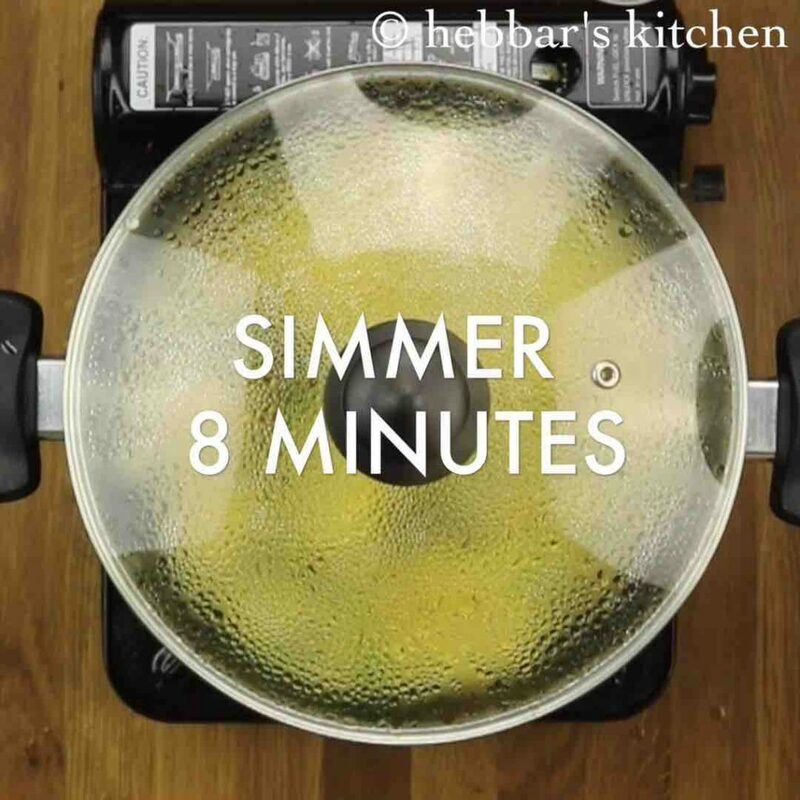 now add ¼ tsp turmeric and ½ tsp chilli powder. saute for a minute. 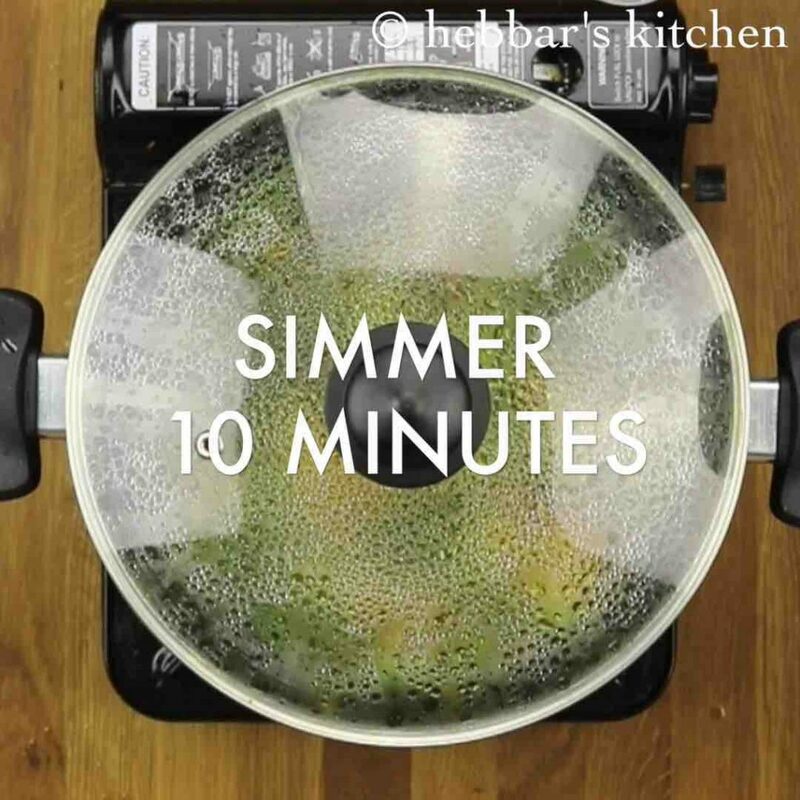 now add ¼ cup peas, 2½ cups of water and salt to taste. if cooking in pressure cooker just add 2 cups of water. 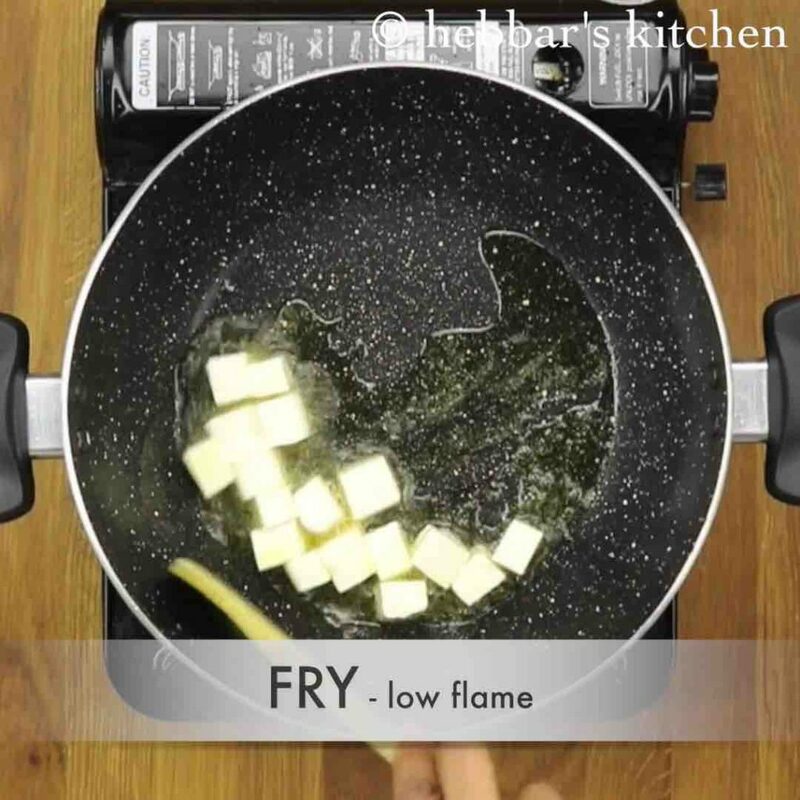 stir well and cover and cook on low flame for 10 minutes. if cooking in pressure cooker then pressure cook for 2 whistles on medium flame. stir occasionally, so that rice gets cooked uniforms and doesn’t burn from bottom. again cover and simmer for 8 minutes or till rice gets cooked well completely. 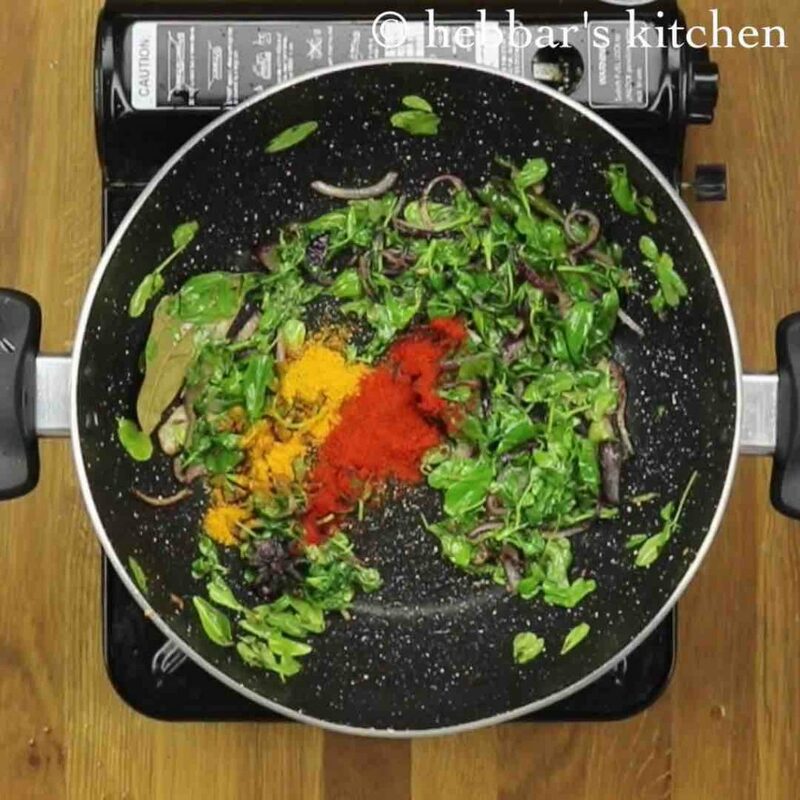 firstly, add vegetables of your choice to make it more healthy. also to cook in cooker, pressure cook for 2 whistles on medium flame adding just 2 cups of water. additionally, add tomato to make slightly tangy tomato methi pulao recipe. finally, methi pulao taste great when served with raita. 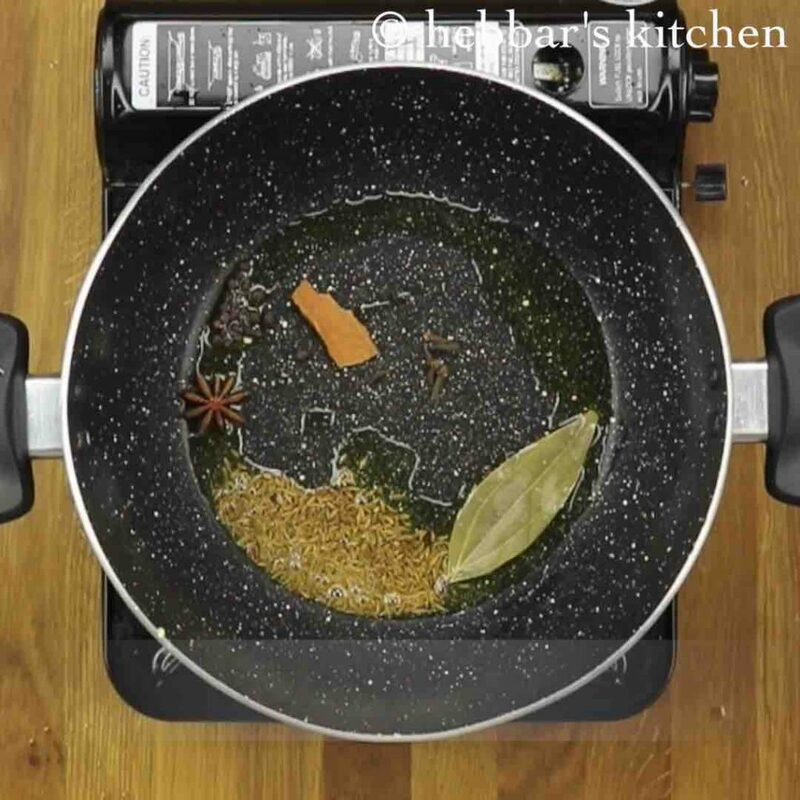 This is one of the best ever Recipe online web. You are Very passionate, and beautifully presented all the recipes here. My father Anand Kamalashile has 50 years of experience in Food industry. He also appreciated. Hi, i tried ur recipe today !! Its delicious, thank u for the wonderful recipe. just tried this recipe today and it turned out to be delicious! love your videos..! appreciate the hard work and planning that goes behind to make it look simple and do-able. Just tried this today and it turned out to be delicious. .! love your videos and appreciate the hard work and planning that goes behind!